What would we do without StackOverflow? One thing is for sure, our code would be a lot less elegant and would have meteor sized holes. It’s so ubiquitous that it’s even listed as a Harvard professor at RateMyProfessors.com. (Best comment from a ‘student’: “Asked a question about a project. He responded telling me that he had found a solution 4 years ago and didn’t go into any more detail.”) When it comes to Python, StackOverflow is a bustling hub of questions and answers. What are developers searching for when they turn to StackOverflow for help? 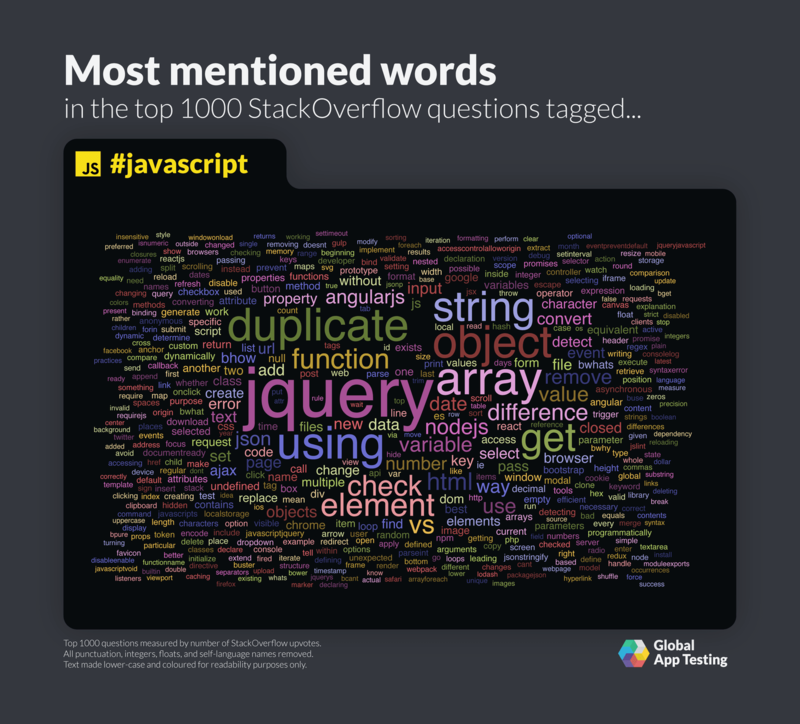 Global App Testing crunched the data and found the most mentioned words in the top 1,000 StackOverflow questions. Meanwhile Python users are asking about data processing libraries. 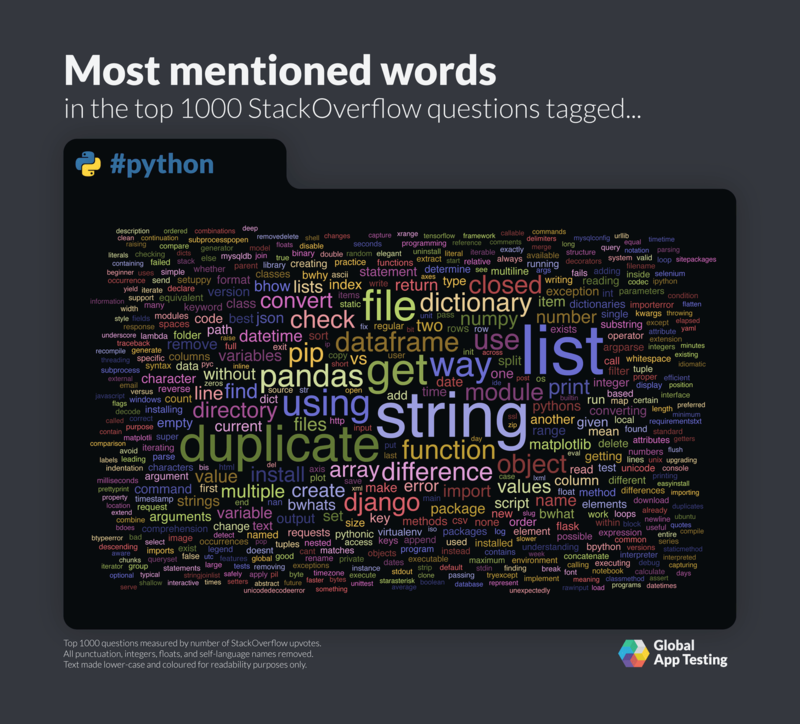 The top terms includes “pandas” and “dataframe”. Besides this, users are also asking about the high-level web development framework Django. Since Python is a general usage language, it isn’t limited to just data science, even though it’s frequently a favorite among scientists. 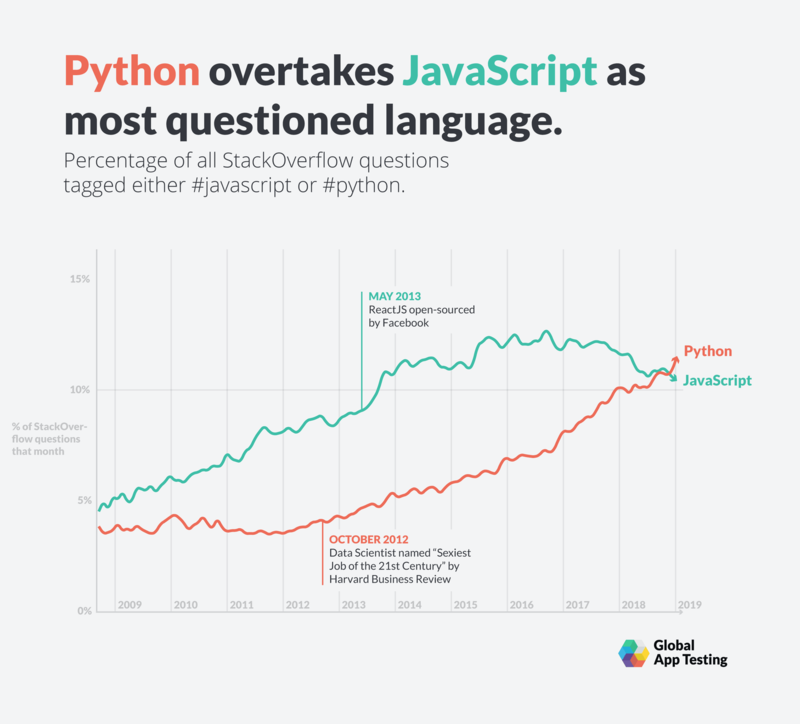 Make no misssssstake, Python has been rising in popularity. Meanwhile, on GitHub Python snaked ahead to the number one language for machine learning in 2018. Surely, its common usage in machine learning helped give it a boost up the ladder. Pair that with its frequent usage by data scientists, and you have a recipe for a language that’s inescapable. The amount of programmers who use Python as their primary language grew in 2018 as well. The second annual Python Developers Survey showed off its thriving ecosystem. All of these milestones point towards one conclusion: Python’s glory days are here. Welcome to the golden age.